Disney’s Pocahontas released in 1995 and is an animated romantic musical. Yeah, that’s quite the mix but Disney’s formula works for Pocahontas. Telling the story of the American Indian Pocahontas (Irene Bedard) and Captain John Smith (Mel Gibson), you see how two worlds can collide. Pocahontas comes from an American Indian tribe. John Smith arrives on a ship looking for gold. The Indian tribe were a fairly peaceful people. The people John Smith arrived with were ready to kill the savages. Worlds collide. Love blossoms. And leadership lessons abound. There were two leaders on the Susan Constant, Captain John Smith and Governor Ratcliff (David Ogden Stiers). The Governor expected and demanded respect from the crew. On the other hand, Captain John Smith earned the respect of the crew. There was a sense the men knew John. They knew he had accomplished much. And for that, they respected him. You can’t expect to go into a leadership position and demand respect. Respect doesn’t work that way. You have to earn respect for respect to be truly given. Give your people a reason to respect you. The Susan Constant was caught in a violent storm. The ship was being tossed to and fro. Her situation looked perilous as the crew frantically worked to make sure they would make it to land safely. John Smith saw what was going on. He didn’t sit back and wait for the crew to fix everything. No, he went about helping them. He saw what needed to be done. When he saw something, he pointed it out to the crew. If the crew was struggling, he pitched in and helped them get their job done. What are you doing as a leader? Are you willing to point the way? After that, what are you willing to do? Are you willing to get your hands dirty and help out when needed? Great leaders pitch in when needed. They see a need, they direct the team, and then help. The storm was violent and washed a man overboard. Had John Smith not acted quickly, he would’ve been lost to the ocean. However, John’s crew had to act swiftly and together. John Smith jumped into the violent sea and dove deep to rescue Thomas (Christian Bale). As he did this, the rope he was holding failed. The crew jumped in to work together. They grabbed the broken rope. They began pulling together to get John Smith and Thomas safely back to the boat. Without teamwork, both of them could have died. You have to work to create a team that will work together. These men and women will have each other’s backs and work to get whatever job finished. Look for ways to team build and create relationships within your team. These relationships will be the backbone of a team that is willing to work well together. The Governor was a bad, bad man. He was selfish and out for his own gain. He would often call the crew of the Susan Constant witless and criticize them. There was also something else, he was using the people to gain wealth for himself. He believed there was gold on the shores of Jamestown. And he believed he could work his men to the bone to get the gold. All he saw was dollar signs and fortune. He failed to see his people’s worth. Leadership had a bad rap for a while because it was often taught profit before people. Because of this, leadership and management looked for ways to maximize profits while minimizing people. Be careful if you’re caught in the trap of profits before people. Your people have value and you have to recognize their value. She had to get away from all of the hustle and bustle of the village. She had to get away by herself to truly think. Leaders have to get away from everything that is going on. This time of seclusion can help a leader think more clearly. Find a way to take a sabbatical. Whether this is a half day or a month-long sabbatical, you need time away to think. Chief Powhatan (Russell Means) was Pocahontas’ father. He had a dream for his daughter to marry the warrior Kocoum (James Apaumut Fall). This man was strong and would be able to build her a comfortable life. This wasn’t the dream Pocahontas had for her life. She didn’t want a strong, stern man. She wanted someone who dreamt and had fun and was kind. The contrast of the dreams each of these characters was stark. They butted against one another. You may have heard the dreams of your parents or of your mentors. They told you what they desired in your life. I remember such a time in my life. I was working for Family Christian Stores and my manager had a vision for me. He wanted to see me move into an assistant store manager position and eventually have a store of my own. At first, this dream sounded great. I’d be given more responsibility and move up in the organization. But after talking with my wife, seeing what the position would require, and other concerns Pam and I had, I chose not to take the new position. The dreams of my manager and my dreams collided. This collision actually ended my time at Family Christian Stores. This is alright. Your dreams won’t align with everybody you respect in life. You have to make a choice. To follow the dreams of others. Or to follow your dreams. What is my path? How am I going to find it? While Pocahontas didn’t know her path, she knew she didn’t want to marry Kocoum. So, Pocahontas went to someone wise. She went to Grandmother Willow (Linda Hunt). She asked Grandmother Willow what was her path? How would she know? Grandmother Willow answered her. She gave Pocahontas wisdom she didn’t have before. Great leaders know they don’t have all the answers. They also know there are other people who have gone before them and have more experience than they do. Find a wise mentor to seek advice from when you don’t know what to do next. Ask them if they would be willing to help you learn what the next steps are. Then, most importantly, you have to listen to the wisdom you’re given. If you only listen and then fail to take action, it’s as if you were never mentored. There’s an urge to jump into the thick of things before observing the land and figuring out what is actually going on. Kocoum wanted to jump directly into battle with The Governor and John Smith’s crew. He thought the best course of action was to kill the white invaders. However, Kocoum was counseled to observe the strangers. To see what threat they posed. Be careful wanting to act before thinking and observing. You can learn a lot by taking the time to step back and get the full picture. Have you ever found there was a communication disconnect between you and the people you lead? Have you thought it could be because you speak a different language than your team? We see this in Pocahontas. As John Smith and Pocahontas begin to talk, you see they can’t communicate because they speak different languages. This communication barrier was broken because of movie magic but that doesn’t happen in real life. You have to work at learning the communication style of your team. Work with them. Find out how they communicate, what’s important to them, and what works best. Chief Powhatan knew his tribe couldn’t defeat the white men alone. He would need the help of fellow tribe leaders and their people. He sent word to the neighboring tribe. This call was for help. And the tribes responded. Do you do leadership alone? Have you become an island unto yourself? You need to stop. You need to realize you can’t lead alone. Well, at least not for long. Leaders require the input of other people. Whether this is input from those on your team, an advisory board, or mentors. You need to find people to help you along your leadership journey. Sometimes the right path isn’t the easiest. We’ve been conditioned to take the easiest path we can. If the path is clear and straight, we often believe this is the way to go. Whether we call this God opening the way or a sign, we see clear paths and sunny skies as our calling. Yet Grandmother Willow tells us something different in Pocahontas. Sometimes the right path isn’t the easy path. You have to be careful of looking for ease or comfort. These things can be deceiving. Know the right path won’t always be easy. The right path may be the most difficult path you’ll ever take. Wiggins was a manservant to Governor Ratcliffe. He was the Governor’s right-hand man. By the end of Pocahontas, he realized something about the Governor. The Governor wasn’t all he was made out to be. He wasn’t a leader people should follow. Wiggins was disappointed by the Governor. He had failed the people and was a traitor. His hero had fallen despite glowing recommendations. There will be people who come highly recommended to you. You will be tempted to quickly bring them onto your team. Yet you need to be cautious. When someone comes recommended, make sure to check them out thoroughly. Even then, you might be disappointed in the end result. But be cautious. Highly recommended people aren’t always the best people. Question: Have you seen Disney’s Pocahontas? If you have, did you take away any leadership lessons from Pocahontas? 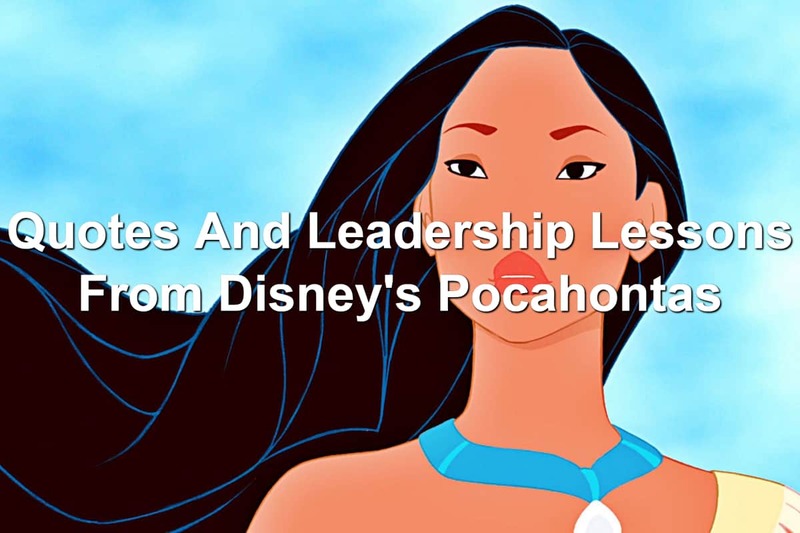 If you haven’t seen the movie, what leadership lessons from Pocahontas that I shared resonated with you? Let me know in the comment section below.